In Togo, education is in French. Yet, many Togolese children speak only Ewe or Mina. In 2016, our teams noticed the difficulties encountered by children during written and oral expression workshops organised inside our partner schools. For those with no access to kindergarten or with parents with no knowledge of French, the arrival in first grade also means exclusion: from the first hour of class, they are already lost and already marked out as losers. 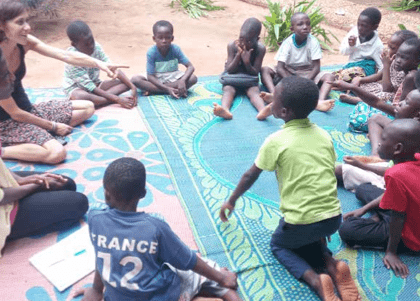 The team of La Chaîne de l’Espoir has therefore decided to launch an after-school initiative to enable the children to discover the French language. This playful learning provides 240 children aged 6 or 7 with the opportunity to learn the language step by step. They learn French through play, mime and drawing, encouraged by facilitators specifically trained to accompany them through this process in a cheerful manner. Every week, children have 2 to 4 hours workshop. Courses continue during the holidays, to ensure continuous learning and put all the odds on their side at the start of the next academic year. Lastly, in order for the children to continue working at home, La Chaîne de l’Espoir also organises literacy courses for the mothers.